Nowadays, not many buildings go about without having a working air conditioning system. Some go all the way and get a central heaving and air system, while others go for something simpler and just get a large unit installed by a window or area in the wall. Even the smallest unit can make a noticeable difference when it comes to the comfort level of a business. It can make any home or workplace more appealing when the temperature is kept at a constant level and it is not fluctuating with the exterior environment. Because of all of this, it’s important to have your unit looked at from time to time by a Charlotte AC repair specialist. These companies are highly trained and know what vulnerabilities to look for – they can tell any problems that your unit may have in the future, and are more than willing to help clear up any problems. 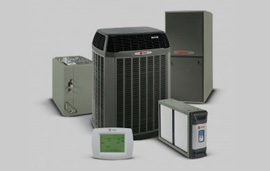 Charlotte AC repair companies are here to help you out. Whether you need a regular maintenance, repair, or emergency repair services, they can show up at your doorstep with all the necessary tools to bring your units back to life. A lot of business owners like keeping an emergency Charlotte AC repair business’s number on hand in case the unit breaks unexpectedly- they don’t want uncomfortable customers or employees, so they need it fixed as soon as possible. The same is true for parents who don’t want their younger children to grow uncomfortable in the summer heat. At the end of the day, these repair service companies are here to look out for you and keep you comfortable – keep them in mind whenever you think it’s time to maintain your AC unit.